There are few products that synthesize the adventure and the data compiler as well as a pedometer. In a way, it is the convergence of the Dionysian and Apollonian desires found within the outdoor enthusiast. So satiate these juxtaposed desires and get yourself a spiffy new pedometer! 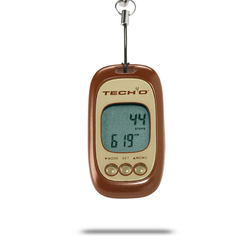 We here at US Outdoor have shopped around for you, and the pedometers on this page are the best bang for your buck! Featuring brands such as Oregon Scientific and TECH 40. What are you waiting for? Track yourself today!